Busch Gardens Tampa Bay is celebrating two endangered species thriving under the park’s care with the first birthday of Malu, a Bornean orangutan, and the newest autumn arrivals at the park: four fluffy African penguin chicks. Just in time for African Penguin Awareness Day on Saturday, 13 October, the park welcomes four penguin chicks to the rookery. Park guests will have the first opportunity to see the newest additions to the Busch Gardens penguin family as a part of the park’s African Penguin Awareness Day celebration. The hatchlings will appear intermittently in the Animal Care Center, where guests can watch as the zoo team provides for the young birds. This year’s babies are the largest group of penguin chicks ever hatched at Busch Gardens. At this stage in their development, the young chicks are expected to eat 60% of their body weight each day to ensure proper growth. Varying in age from two to four weeks old, the chicks are under 24-hour supervision with the animal care team at Busch Gardens. On Sunday, 14 October, it’s an orangutan birthday! Malu was born on October 14, 2017 to first-time mom Luna, weighing just over eight pounds. 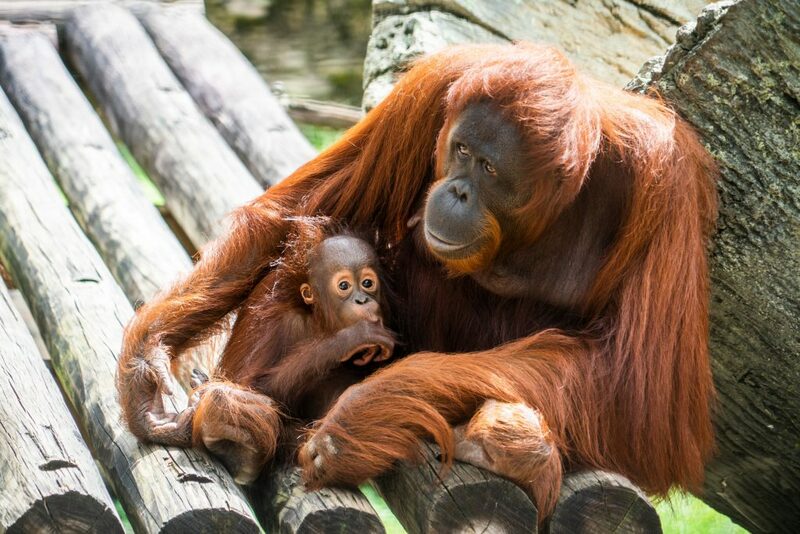 His arrival was monumental for Busch Gardens, as orangutans typically only have one baby every 7-10 years. Today, he is a healthy and curious young ape, growing strong and learning alongside his mother each day. There will be a birthday celebration for Malu at 1pm on Sunday in the Jungala area of the park. As one of the largest zoos in the USA, Busch Gardens Tampa Bay’s animal care team plays a vital role in the Species Survival Plan (SSP) for a number of endangered species. The African penguin and the Bornean orangutan are both endangered in the wild, largely due to habitat loss caused by humans. Each baby animal at the park sparks new hope for their species as they bring awareness to the plight of their wild counterparts. The SeaWorld & Busch Gardens Conservation Fund supports research and conservation projects, including initiatives that directly benefit African penguins and Bornean orangutans.